Yesterday, the Roosevelt Island Operating Corporation announced schedules for a committee of Residents Association volunteers to oversee final interviews for this year's round of Public Purpose Grants. 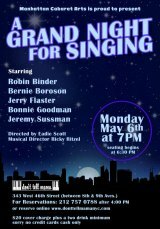 The Roosevelt Island Residents Association's Common Council has struggled to recruit membership in recent years. 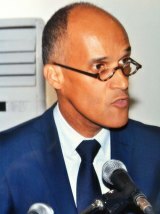 As they've become more unified in representing the community, especially in resistance to RIOC's heavy-handed presence, they're actively working to bring more residents eager to serve. Is a stronger, more effective Common Council emerging...? 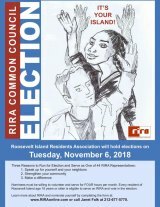 Like other local government posts, those making up the Roosevelt Island Residents Association Common Council are up for grabs on November 6th. Unlike the others, the Common Council stands a chance of having real influence on how our community is run. Elections for the Roosevelt Island Common Council take place along with national and other local elections on November 6th. The Daily invites all residents vying for seats to submit statements supporting their candidacy. David Lawson, a Westview resident, is running for Vice President. In 1979, Dorothy and Herman Reade started the Roosevelt Island Library on the ground floor at Westview. Among contributors was literary legend Alice Childress. Today, their legacies were not forgotten as the New York Public Library formally broke ground on a new home, bigger and broader than they could have imagined. In a meeting strategically designed to highlight efforts to fix a broken system, RIOC outlined plans to overhaul water supplies underlying parks and playground irrigation and drinking fountains. Representatives promised future compliance, but failed utterly to take responsibility for past failures bringing Roosevelt Island to its water crisis. Hudson Related Retail LLC today announced the signing of hot-pot restaurant Liukoshui to a 10-year, 505 square foot lease at 568 Main Street. The location was most recently the home of a flower shop between Roosevelt Island Nails and a Child School entrance. Last Thursday, Carter Burden Network CEO Bill Dionne introduced the AdvantAge Survey, a nationwide effort by the Visiting Nurse Service to come up with fresh ideas to better serve seniors. The goal is to identify basic needs at the source and figure out how best to address them. 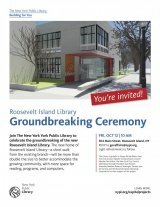 Celebrate the groundbreaking of the new Roosevelt Island Library. You're invited to join officials from the New York Public Library on Friday, October 12th at 10:00 at the new site at 504 Main Street and witness a milestone in community history. FDR Four Freedoms to Roosevelt Island: Thanks a Million! It's 2005, and William J. vanden Heuvel digs his heels in, determined to see the four acre park Louis Kahn designed to honor Franklin Delano Roosevelt on the Island named after him built. A former U.N. ambassador, vanden Heuvel sees his efforts rewarded in 2012 when FDR Four Freedoms Park opens. Yesterday, just six years later, the most serene outdoor space in New York City welcomed its one-millionth visitor. Conservancy CEO Howard Axel thanked Roosevelt Island for being the park's home.